Capella Flavor Drops are water soluble, highly concentrated, multi-purpose flavor concentrates, feature lack of fats, calories, sweeteners or sodium. The highly concentrated nature of our Flavor Drops allows us to deliver a superior flavor concentrate, free from preservatives and stabilizers. Many flavored syrups require the addition of preservatives to inhibit mold growth due to the syrup's high water and sugar content. 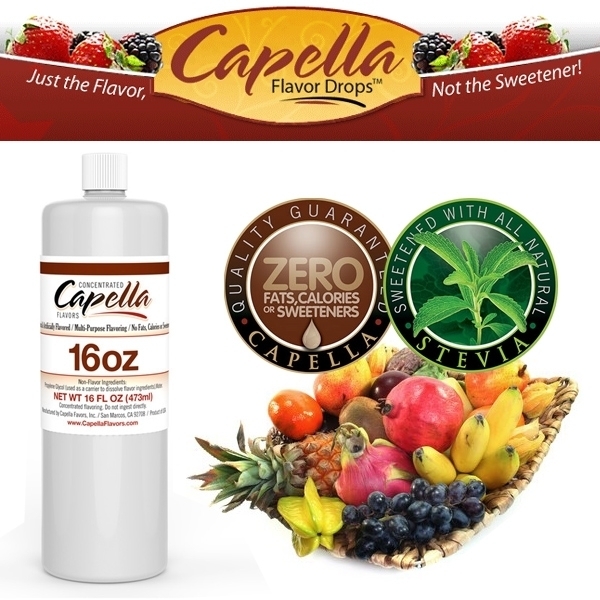 Capella Flavor Drops deliver honest, undiluted, preservative-free flavor. Capella Flavor Drops are proudly made with the finest ingredients in San Marcos, California USA. Flavor Drops are Corn & Peanut derivative free! Flavor Drops are Preservative Free (No Potassium Sorbate)!